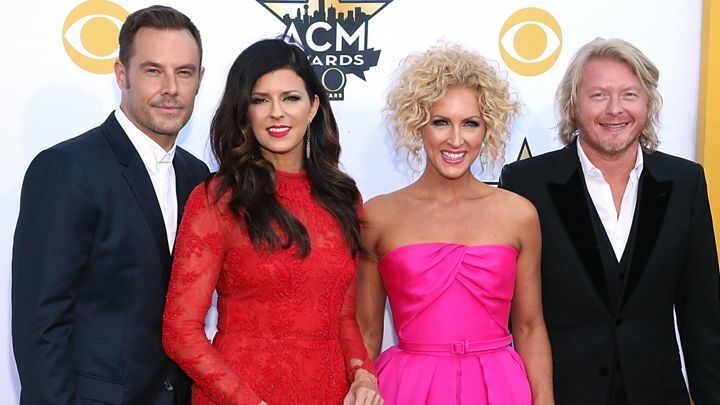 Who are The Little Big Town Members, Are They Married, What is Their Net Worth? Jimi Westbrook, Kimberly Schlapman, Phillip Sweet and Karen Fairchild joined talent with skills and unwavering dedication to form the country quartet dubbed The Little Big Town. Formerly a duo formed towards the end of the 1990s, the country music band metamorphosed into a trio and finally had four members who play different instruments and alternates as lead vocalists to produce award-winning hits for the band. The beginning wasn’t a walk in the park for the music group who performed, recorded and wrote music which seemed unproductive at first. Their first recording contract was with the Mercury Nashville Records label, a deal that didn’t see to the release of any song. In 2002, the unrelenting band debuted on the airwaves with their eponymous album under Monument Records. With just two minor country chart singles, the piece was somewhat of a commercial flop. Little Big Town Members left Monument Records to join another label known as Equity Music Group in 2005. The same year, they dropped their sophomore album titled The Road to Here, marking the beginning of greater heights. The album got a platinum certification from the Recording Industry Association of America (RIAA) and equally set the pace for more success and the band on a highway to superstardom. Their dedication and perseverance had paid off and The Little Big Town members showed no sign of resting on their oars. They released a third album – A Place to Land, under the stable of Equity, but later released it once again under Capitol Records Nashville following the closure of Equity in 2008. Under Capitol Records, other albums including The Reason Why (2010), Tornado (2012), Pain Killer (2014), Wanderlust (2016), and The Breaker (2017) were released. Their albums have produced several hit singles, some of which landed on Hot Country Songs charts. Consequently, the quartet that was once seen as failure has over thirty awards and several nominations to show off for their years of perseverance and hard work. Let’s get to meet the four members who worked through thick and thin to take The Little Big Town to different heights. They have stayed together since the group was formed in 1998 and have shown no sign of going their separate ways. Since 1998, Karen Fairchild and her Little Big Town bandmates have proved their worth in the entertainment industry. Born on 28 September 1969 in Gary, Indiana, USA, Karen spent most part of her childhood in Marietta, Georgia. While details of her early education are not available, we gathered that she got her degree from Samford University in Birmingham, Alabama. Not only did she acquire her educational qualifications there, but she also met lifetime friends like Kimberly Schlapman who would later join her in making good music as Little Big Town members. Before she found her current abode with the Little Big Town music group, Karen was a lead singer with the Christian vocal group Truth. She featured in some of their songs and later started a duo called KarenLeigh with Leigh Cappillino. The two produced two singles – Save it For a Rainy Day and This Love Has. She then met Kimberly Schlapman at Samford and the journey to The Little Big Town was launched. Karen Fairchild stands at an average height of 5 feet 6 inches with her current body weight listed as 54kg or 119 pounds. Westbrook is an American musician born on October 20th, 1971. His birth occurred in Arkansas, United States. His interest in music and entertainment began to build up at a very early stage when he equally started honing his skills. If he attended any school in the past, the information is yet to be shared by the singer, thus, there’s nothing on his educational background. His only known sibling is a sister named Joyce Marie Westbrook Morgan. Just like most part of his personal life, details about the body stats of Jimi have not been made public but from the obvious, he sports a pair of blue eyes. Also, he visibly has distinct features and physique that set him aside as a handsome man. The Little Big Town member doubles as a chef. Formerly known as Kimberly Roads, Schlapman was born on the 15th day of October 1969 in Cornelia, Georgia, USA. information about her parents are not made public but she has one known sibling, a sister known as Paula James. In addition to excelling in her music career, Kimberly Schlapman has also used her passion for food to establish a successful career in cooking. In 2012, she anchored her own hit show dubbed Kimberly’s Simply Southern at the Great American Country channel. Kimberly’s show garnered a plethora of viewers who flocked in and got hooked on her southern charm. Apparently, singing and cooking are not her only forte, she is also a published writer with her first cookbook titled OH GUSSIE! Cooking and Visiting in Kimberly’s Southern Kitchen making waves on TV shows. Notably, her book got to feature on top shows on national TV. The Today’s Show and Dr. Oz are some of the shows that featured it. Kimberly stands at an average of 5 feet 6 inches in height, complimented by her weight of 54 kg. Her set of beautiful blue eyes coupled with an attractive blonde hair gives her appearance an angelic touch. Furthermore, she has feet size of 9 (US) and wears a dress size listed as 4 (US). The youngest of The Little Big Town members, Phillip Sweet was born in the United States of America on the 18th day of March 1974. There is hardly any information regarding his early life and family details. Likewise, it is not clear if he graduated from any school as such details have been neatly tucked away. He completes the country quartet alongside bandmates Karen Fairchild, Kimberly Schlapman and Jimi Westbrook. Being the voice and brain behind chart-hogging hits is a sure ticket to stardom and more money in the bank. Sadly, the Little Big Town stars have no collective net worth as a group but they are worth quite a fortune as individuals. Karen Fairchild has no reliable information regarding her net worth but from the scanty information gathered, the country star sits on a net worth of $3 million. The bulk of her wealth is no doubt from her singing career. The second lady in the group, the ever-cheerful Kimberly Schlapman is also enjoying fame and fortune from her music career with the Little Big Town group. Notably, she also banks as a professional cook who has successfully pulled audiences on her own TV show and has a net worth of $2.5 million to show off for all the years of dedication and passion in her career life. Although he has been a part of the band since 1998, Jimi Westbrook has managed to keep personal details like the figures in his net worth away from the public eye. Despite his decision to keep his net worth a secret, Jimi’s wife and bandmate, Karen Fairchild, has a net worth of $3 million. Phillip Sweet’s net worth is also not published. From the information we gathered, his latest fortune is still being reviewed and before now, he has not made his earnings and net worth a public affair. Are The Little Big Town Members Married? All the members of the country quartet are enjoying the perks of a happy home with their spouses and kids. As expected, some of them found love among fellow bandmates as is common with such groups. The two lovebirds in the band are Karen Fairchild and Jimi Westbrook who became man and wife on May 31, 2006. It was after two months following the wedding that their union was made public. Their first and only child so far, a son named Elijah Dylan Westbrook, expanded the family with his arrival on March 5, 2010, in Nashville. In spite of the controversy that usually trails most celebrity marriages, Karen and Jimi have managed to find a way to combine family and work without much trouble, thus, they have continued to stay strong as a couple. Kimberly Roads, on the other hand, is married to Stephen Schlapman after which she adopted his last name. They got married on November 28th in 2006 and the next year, precisely on July 27, she gave birth to a daughter named Daisy Pearl Schlapman. The couple announced one other addition to their family in January 2017, a baby girl who they adopted earlier on December 31, 2016. They named her Dolly Grace Schlapman. Before Stephen came along, Kimberly was Steven Roads’ wife and later his widow. Stephen was not just her husband but also served as the band’s lawyer. He died after suffering a heart attack in 2005. The youngest member of the group, Phillip Sweet is husband to an entrepreneur and wardrobe stylist known as Rebecca Arthur. They tied the nuptials on March 30, 2007, and welcomed their first kid, a baby girl named Penelopi Jane Sweet on December 27, 2007. Her birth took place at the Baptist Hospital in Nashville. Not much is known about his family as the muso is quite a private person.